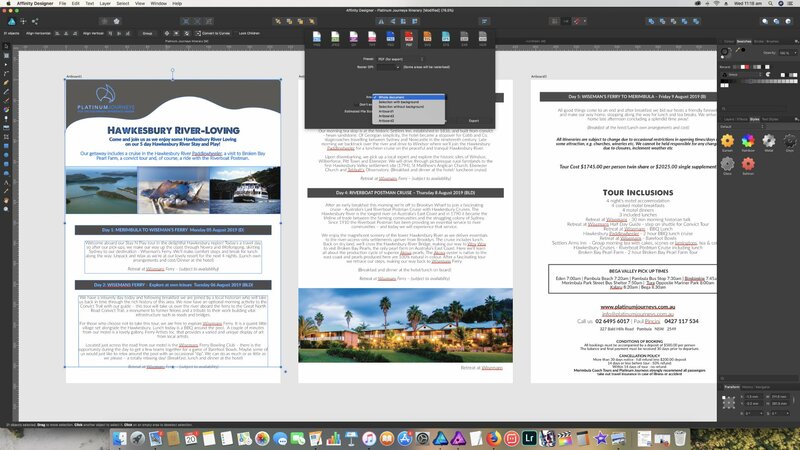 I've been having trouble with using artboards to create multi-page documents. Somehow the order of the pages is getting shuffled while I'm working, and when I go to export the whole document the pages aren't numbered sequentially anymore. I then have to create a whole new document carefully copying & pasting each page before exporting again. What am I doing to make the page orders get mixed up? Can I fix it without creating a whole new document? This looks like it should be in the Designer Bugs forum rather than Publisher Bugs? Check their order in the Layers panel, that's what matters when exporting. The first page (artboard) must be on the bottom, and the last page (artboard) must be on top in the layer's hierarchy.